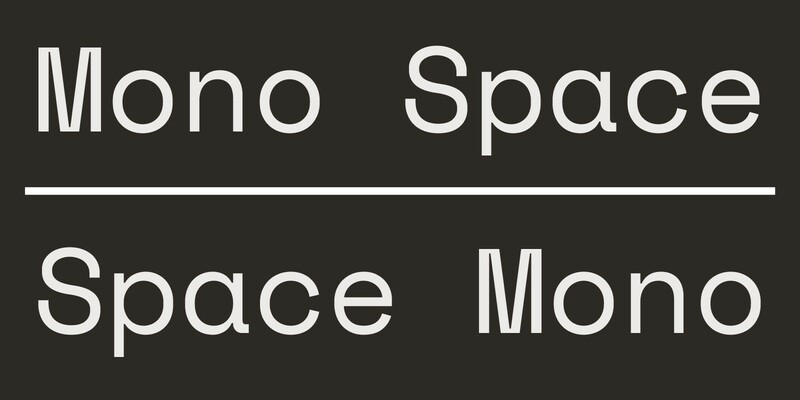 Introducing Space Mono a new monospaced typeface by Colophon Foundry for Google Fonts. As designers of type, we most often find ourselves composing a monospaced (sometimes called a fixed-width, fixed-pitch, or non-proportional) typeface in the service of building out the styles of an accompanying proportional type family or type system. It’s about adapting the proportional type’s forms and rules, and discovering how those letterforms behave within fixed limits to give the face new texture and capability. But what if that constraint was embraced? What if we set out to create a monospaced typeface that wasn’t simply an extension, but rather something unto itself? Weights 1–4 of Space Mono, 2016. 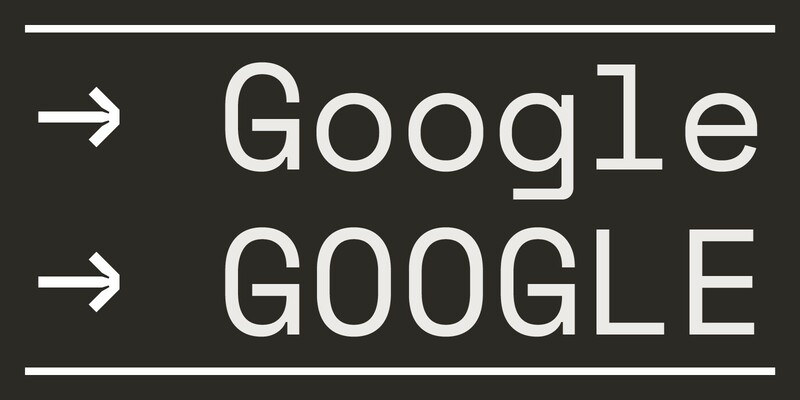 Space Mono — whose name inverts its own typographic classification — is precisely that, a typeface drawn to be innately fixed-pitch that comprises Regular, Italic, Bold, and Bold Italic cuts, commissioned for the 2016 update of Google Fonts. This monospace-first, monospace-only brood was hatched in the summer of 2015, on the heels of a sans-serif family called Basis, which we created at Colophon Foundry UK — again, an instance of a proportional-first, monospace-after progression. Included in Basis’s 16-cut system was the most extensive monospaced component we’d drawn to date: a Regular, its Italic counterpart, and Bold and Bold Italic pairings. Weights 1–16 of Basis Grotesque, 2015. 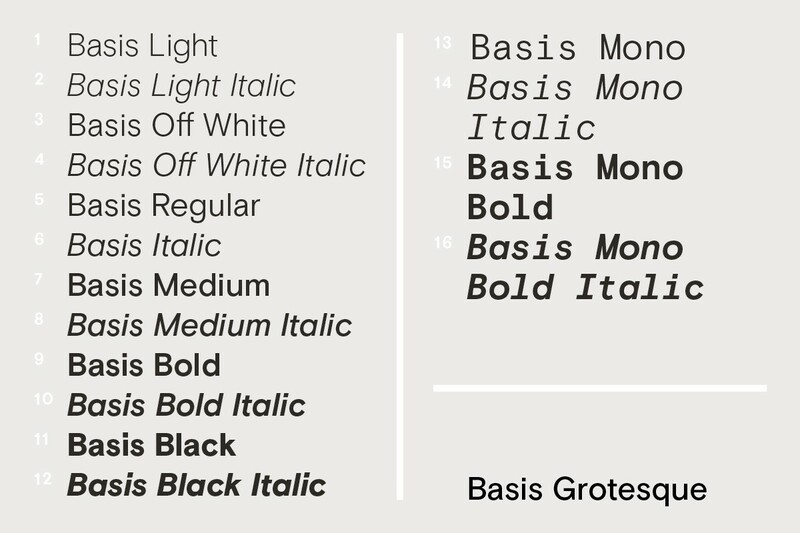 The monospaced cuts reacted to Basis’s grotesque forms in such a way that they still garnered a grotesque classification. 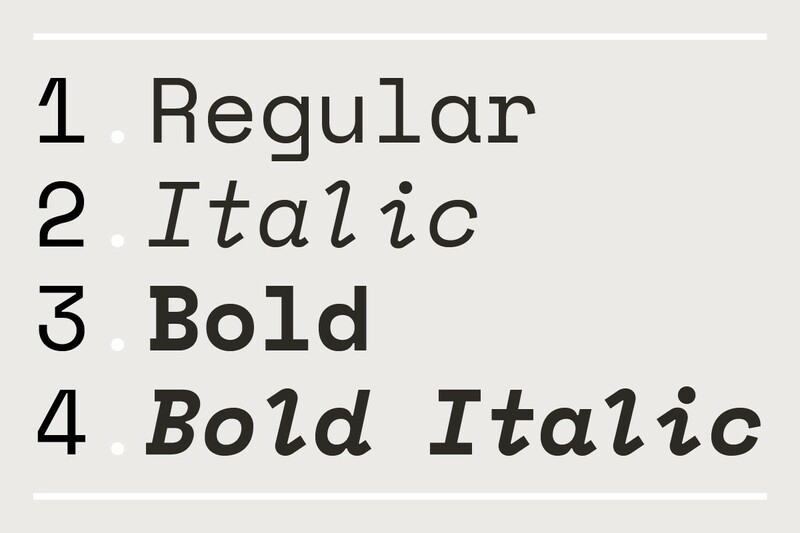 A monospace type, however, doesn’t describe its character or distinctions, but rather its function and construction. And while that construction often dictates form (an ‘m’ may get smushed into its container; an ‘i’ extended outwards with foot and bar), we find it interesting that despite these formal constraints, monospaced type is widely used in editorial settings to give a certain style or feel rather than hit a specific character count or meet a technical limitation. 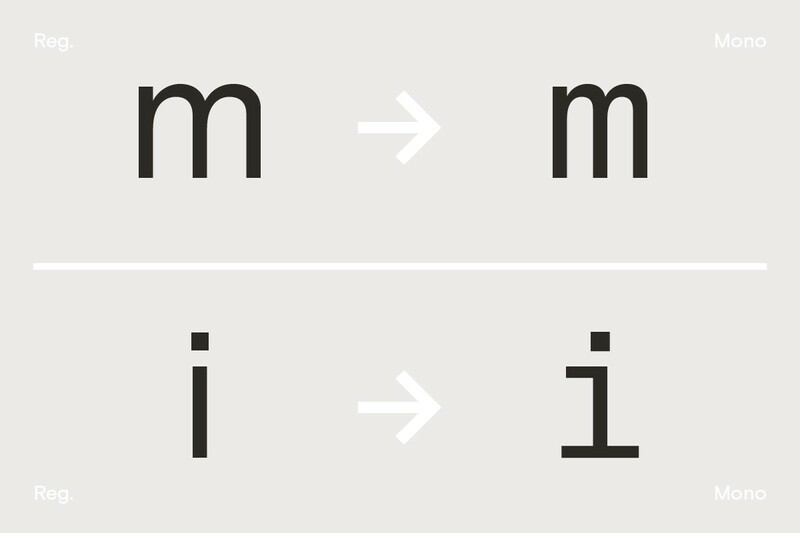 Comparison of Regular and Mono ‘m’ and ‘i’, Basis Grotesque, 2015. Delving into this process got us thinking about what monospace means to us as designers: If we drew a natively monospaced typeface as a sendup of or homage to our abstract perceptions of that typographic designation, what form would it take? Maybe instead of trying to optimize explicitly for readability or performance, or capture an amalgamation of monospaced letterforms or attributes, we could instead mine our cultural associations and exploit the limitations of fixed-width type. So while the click-clack of the typewriter occurred to us for a brief moment (Film Noir!¹ Olivetti! Sottsass!²), the idealized monospace that is closer to our hearts and perhaps more aligned with our cultural touchstones are the displays, monitors, and screens of Speculative Fiction — the imagined or not-yet-real interfaces of our most canonical Sci-Fi films and television programs. Present / Destination. Space Mono, Regular, 2016. Most monospaced typefaces are dictated by text-intensive usage at very small point sizes,³ but we were captivated by the possibility of a monospace writ large, as it is in our collective mind’s eye: a few words projected on a large display, rendered in overly simplified, appealingly vague pieces of warning or counsel that only a trained operator understands, all witnessed via screen-within-imaginary-screen, aboard interplanetary vessels and hovering automobiles. Our evergreen touchstone for this notion, despite its proportional construction, is Aldo Novarese’s Microgramma, 1952 (and later Eurostile, 1962), its distinctive uppercase ‘R’ leading the way and subsequently echoed in our own drawing. The lowercase ‘g’ became a codex, of sorts, for Space Mono’s drawing. Space Mono, Regular, 2016. Over the course of eight months and in coordination with the team at Google Fonts, Space Mono’s personality started to take shape, particularly as we began drawing the lowercase ‘g’ ( the third letter we composed, just after the ‘G’ and ‘o’, just before the ‘l’ and ‘e’ ). Starting from a geometric, affable upper-half, the descending foot of the letterform is drawn to create a strong juxtaposition with its above-baseline counterpart. This gesture opened up the typeface’s voice by embracing its awkwardness. Look closer and you’ll see that the shirt and pants don’t really match. Perhaps that’s where we truly articulated Space Mono’s nerdy charm, its eclectic bevy of references, its particular retro-future voice. 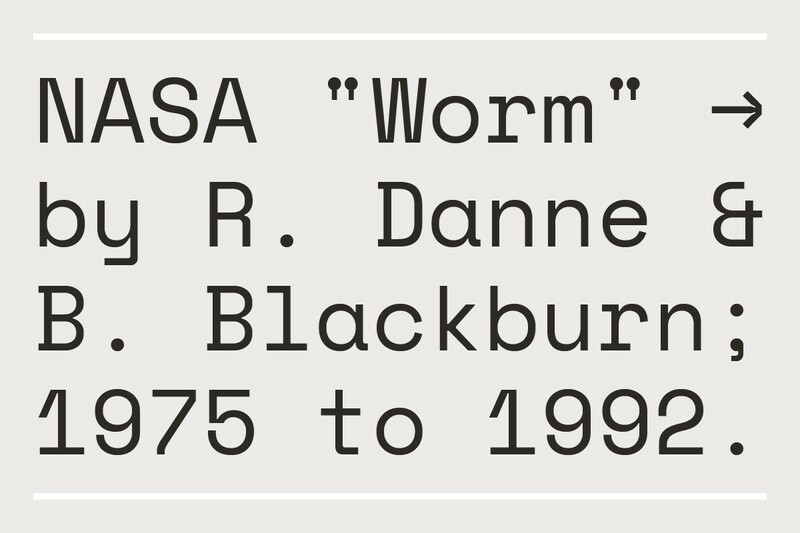 The NASA ‘Worm’ mark influenced certain behaviors within Space Mono. Space Mono, Regular, 2016. Indeed, much of the remainder of the type grew organically from that set of points: The perfectly vertical section in each letterform, quite present in the uppercase and running just a few units in the lower; stylized ink traps that simultaneously harken to very analog print methods and very digital clock readouts; the 90-degree ‘bent-pipe’ behavior initially encountered in Novarese’s designs; an overall texture that is neither beholden to typographic convention or entirely outside of its traditions. Somehow, in seeking to create this notional, future-fictive type, we created nothing of the sort. 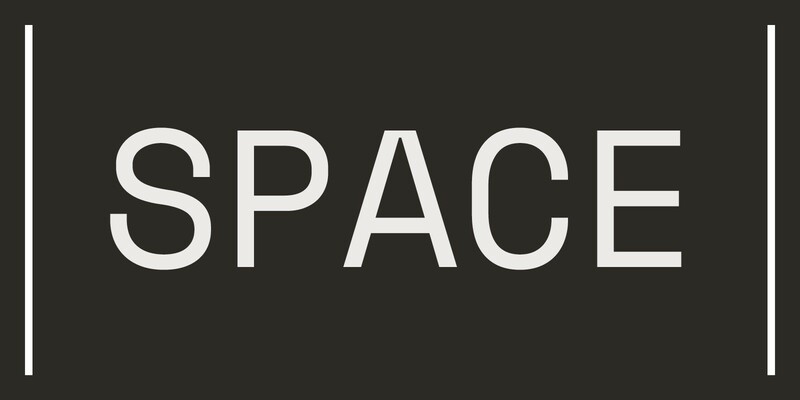 Instead, Space Mono conjures such a plethora of disparate, misremembered source material that it inevitably sits outside of that genre’s familiar canon and becomes something unique unto itself — a monospace from another planet, a typeface from a distant galaxy, an everyday visitor from outer space. 1. We often (somewhat unfairly) associate the typewriter with this genre, applied retrospectively to certain melodramas of the 1940s and ’50s. It’s something about the voice-over narration, often delivered by a private detective and accompanied by the writing of a report upon a typewriter. The character of Deckard in Blade Runner (1982) plays off of this archetype and connects the genres of Film Noir and Sci-Fi in our minds. 2. 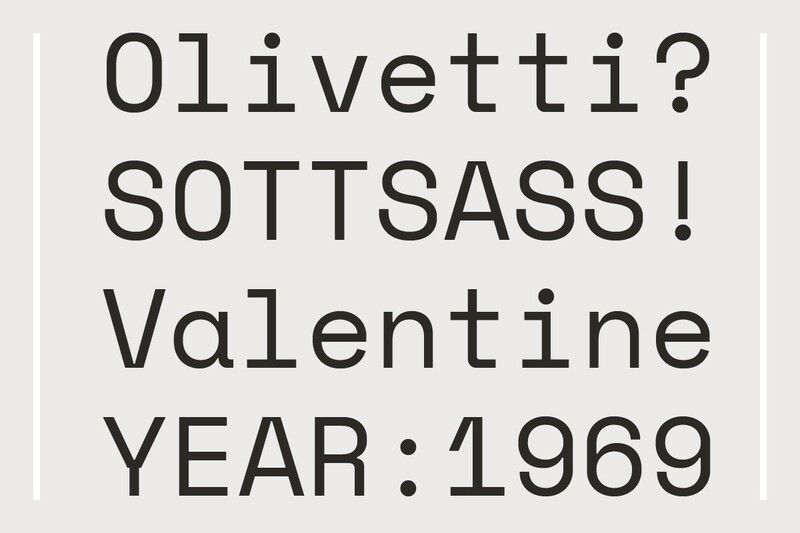 Olivetti is an Italian manufacturer of typewriters and office products, whose attention to design is well-documented. (See: Olivetti: Design in Industry, Museum of Modern Art, 1952). In 1969, the company debuted the Valentine portable typewriter, designed by Ettore Sottsass, who went on to establish the Memphis design collective in 1981. 3. Occasional monospace type applications include, but are not limited to: American Standard Code for Information Interchange (ASCII) art, biochemistry sequencing, cash registers, comb fields, date stamps, Integrated Development Environments (IDEs), musical tablature for guitar and bass, Optical Character Recognition (OCR), password entry boxes, receipts, screenplays and stage plays, source code, tabulated data, technical manuals, terminal emulation, text editors, typewriters, etc. 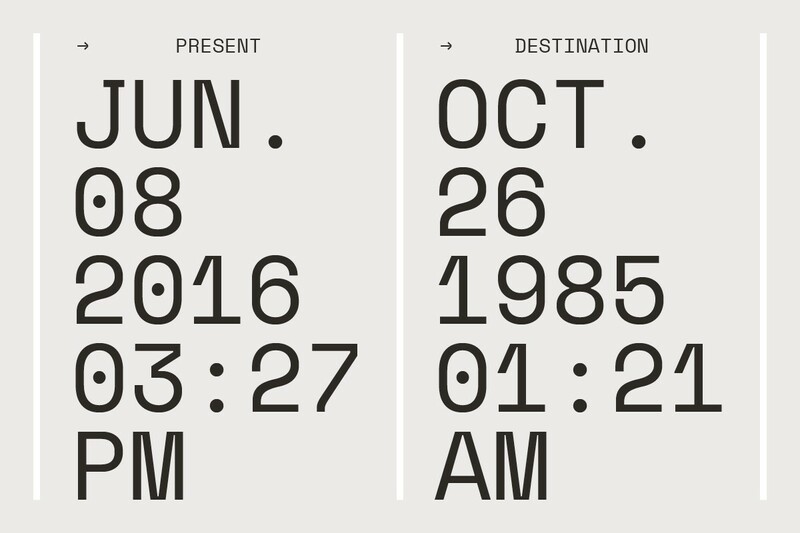 Colophon Foundry is a London- and Los Angeles-based digital type foundry established in 2009. Its members comprise Benjamin Critton (US), Edd Harrington (UK), and Anthony Sheret (UK). The foundry’s commissioned work in type design is complemented by independent and interdependent initiatives in editorial design, publishing, curation, and pedagogy. This essay is excerpted from Mono Space, Space Mono, published by Google, Inc., 2016. 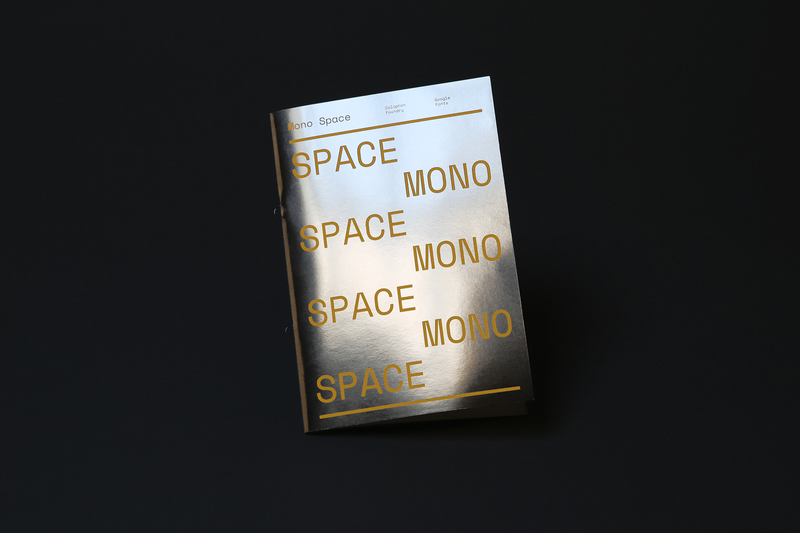 Mono Space, Space Mono specimen cover, published by Google, Inc., 2016.